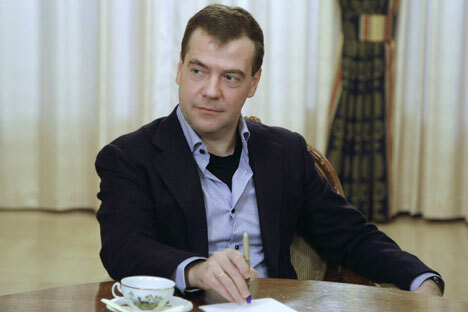 “It is in no way connected with sanctions, it is simply advantageous and useful for us,” Prime Minister Dmitry Medvedev said. Russia should benefit from its geographical proximity to the Asia-Pacific region, Prime Minister Dmitry Medvedev said on Wednesday. “As part of the Asia-Pacific, Russia should exploit the advantages offered by this technology and innovation center,” Medvedev told the Gaidar Economic Forum in Moscow. “It is in no way connected with sanctions. It is simply advantageous and useful for us,” he said, noting that Asia-Pacific economies accounted for about a quarter of Russian foreign trade and for more than half of global GDP. Particular attention would still be paid to cooperation with neighbors, the prime minister said, recalling that the Eurasian Economic Union, comprising Russia, Belarus and Kazakhstan, became operational in January this year. He also recalled that Armenia had recently joined an initially three-member-state Moscow-led Customs Union, and a treaty on Kyrgyzstan’s accession to the alliance would come into force in the coming months. “This confirms that our association is generally attractive and it is developing in the best interests of all its participants,” Medvedev told the forum. The prime minister noted that this year Russia was due to host a summit of the BRICS developing-nation assembly of Brazil, Russia, India, China and South Africa, and a summit of the Shanghai Cooperation Organization (SCO), a security grouping comprising Russia, China and the Central Asian former Soviet republics of Kazakhstan, Kyrgyzstan, Tajikistan and Uzbekistan. Medvedev said it was necessary, therefore, not only to establish political interaction but also to work on new financial institutions, such as a development bank and a pool of BRICS currency reserves. SCO member states were also developing financing mechanisms to fast-track promising projects, he added. “All these multifaceted instruments of joint lending help to implement new economic projects,” Medvedev said, stressing that Russia would also continue working on agendas of other international organisations and forums, including the G20 summit. “Some important macroeconomic and financial initiatives were presented in Brisbane last year,” the prime minister said. “We have started discussing many of them during Russia's (G20) presidency. We will continue this work,” he added.